Blade III:Trinity: Blade kills vampires amid much bad acting and dialogue, do da, do da. Don’t even rent it, you’ll be wasting precious moments of your life, much less your money. Meet the Fockers: A guy takes his girlfriend’s stuck-up parents to meet his laid back hippie parents, I think they called the sitcom version of this Darma and Greg. A cute comedy with most of the best bits already in the preview, but it still made me and the rest of the audience laugh. A nice rental. Hide and Seek: After his wife’s suicide, a psychiatrist takes his young daughter to the countryside to recuperate and weird things start happening in the horror-thriller way of things. I admit this one did a decent job of keeping me guessing what was going on right up until the end (it has a typical Hollywood ending once the truth comes out, but is good until then) and with lots of red-herrings and misdirections. I’d actually recommend this one as a rental. Here in Taiwan there are a number of lotteries, just like the US and Canada. It seems egocentrism helps people everywhere to believe that they will indeed be that 1 in a million and manage to become rich overnight. Meanwhile, the people who do become rich overnight are the people who run the lotteries…Except in Taiwan. Here in Taipei the city government along with the Bank of Taipei run the local lotteries and they came up with what I can only call an ingenious way of selling the tickets. They license certain individuals to be authorized sellers (much as I suspect we do in Canada), but here the only people licensed to sell lottery tickets are the handicapped! Yes, you heard me right, they only let physically disabled people sell lottery tickets, with the seller getting their cut of the proceeds instead of some kind of government welfare. The disabled people automatically have work and a way to feed themselves and their families, and the government still gets the huge revenues that come from lottery winnings. It’s a totally win-win situation which turns a social vice into a social boon (the ethics and question of gambling itself aside), and instead of hiding in their homes the disabled are out among the rest of the people of the city being the part of society they should be. This morning I signed my contract with Kojen Corporation to become their newest ESP teacher, yes, that’s right, I’m an ESPer! And I know what you’re thinking (ha ha), what the heck does ESP stand for? English for Specific Purposes, or in this case for office workers and other government and corporate employees. The contract requires that I be available Monday-Saturday, Mornings to Evenings and work at least 18 hours a week, although I’m told the person whose hours I’m probably getting is working around 25 hours/week right now. For those hours, I get paid roughly double what the locals are getting, so realistically I’m getting the equivalent of full-time pay for a working half the time at a job where I have no office hours and don’t have to even report to the office except to check-in once or twice a week. Plus, I get up to a month of vacation time any time I want it, and can even take it in pieces, and that doesn’t include my sick leave. Now the bad news, I can’t use any of that vacation time during July or August, since they are holiday months and it seems everyone wants to learn English then. I am also obligated to work 30 hours a week during those months, but I’m told I will be assigned temporarily to a school where the clients will come to my air-conditioned self for most of those extra hours. On the apartment front, I just accepted a recently (5 months ago) renovated apartment, fully furnished, with free TV, fridge, air conditioning, utilities, ADSL high-speed internet and washer and dryer which I’m getting at a steal of a price. (Roughly 1/4 my monthly salary, which is good for Taipei.) It’s next to a major mall/movie theatre complex and one bus stop away in either direction from major shopping and eating areas. The catches? Well, there’s no kitchen, so I will have to eat out a lot (which is normal here, buying and making food and eating out cost almost the same) or use Connie’s family kitchen to prepare things. The other catch is that the place is about the size of a University residence room, which for those who know me means it’s the size of my bedroom back in London, a residence room in Saugeen Hall at UWO, or your typical single bedroom. I figure I will hardly be there, and the area is filled with coffee shops and parks, so I should be able to keep from going stir-crazy. But, if I do, you’ll probably know pretty quick. I’m taking over another person’s lease, so instead of a year, I just have a 5 month lease, so if it’s not working out I can always find another place. I will admit I am a tiny bit hesitant because of the size of the place, but it won’t be the first time I lived in a residence room type place. We’ll see how it goes. So, that’s it then. Rob is now a resident of Taipei, employed and housed. I will pass along my address and phone numbers (residence and cell) when I have them. I start teaching my first class next Thursday at noon, and I’m looking forward to it. Oh, and in other news this is a holiday weekend here, a nice 3 day weekend. I guess I will be spending it moving in and setting up, so many little things to buy and I’ll have to see what the girl before me left behind. She wasn’t a neat freak, but it looks like she was pretty clean. Today as I was riding in a taxi through the city streets of Taipei I was reminded of a commercial from Denmark I once saw. In the commercial, which I saw a few times on the internet since it was so funny, a happy Danish family gets in their car for a trip and the after they’ve belted themselves in the father turns on the radio. From the radio comes a catchy rock-pop song and the family smiles, laughs and begins bopping to the beat as they begin their family trip. Now, the catch is that the pop song (which indeed was a nice catchy tune) consisted of the lyrics “I’m going to f*** you in the a**” repeated over and over again. As they drive off, the logo for an English school comes on the screen. A really funny ad, although it does occur to me that since the commercial isn’t subtitled in Danish real Danes watching the commercial who don’t know those choice words aren’t going to get the joke of the commercial. So back to Rob in Taipei. A similar thing happened two weeks ago when I first got here and began channel surfing on the local cable package they have in the house. Once I hit the English movie networks all bets were off regarding language and content, I watched Kill Bill Vol.1 uncut and uncensored on one of the movie networks last weekend, and the content issues aside (violent swordplay is standard prime time TV fare here, so that isn’t a problem) the language used in the movie stuck out like a sore thumb. I asked Connie if the language in Taiwanese shows were uncensored too, and her reply was that they were actually quite censored. They’re not letting any colorful local language on the air at all, but like the Danish family in the ad the Taiwanese are being allowed to hear some of the nastiest parts of the English language at any day or time. (With the subtitles presumably downplaying the terms being used.) In a country where they teach English as a standard course in school, and it’s well on it’s way to becoming the third (fourth?) language of Taiwan, they might consider watching what the kids are hearing because while the parents don’t understand it, the current generation of kids probably will. Then again, I speak Japanese like an anime character or superhero, so who am I to complain about learning the wrong parts of the language…. I apologize to one and all that I haven’t been updating this blog much since I got back from Singapore, but there has been a good reason. 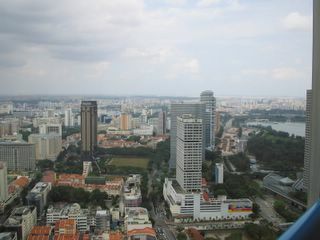 Upon my return from Singapore I found myself with roughly 1 week in which to find employment and a new place to live. Connie’s brother has returned home from school, and 4 of us in a 3 bedroom appartment is getting a little crowded, so I took it upon myself to find new accomodations. Of course, Taipei is a big city, and where I worked would determine which area I lived in, so I was stuck in a chicken and egg scenario of needing a place to live but not knowing where I would be working while I had to find a place to live. I actually found a great appartment near Connie’s family home, but right after I found it…. I recieved a call from the KoJen (KeJian in PinYin) Corporation, one of the largest school chains here in Taiwan asking me to come in for an interview. I’d sent them my resume as a last resort, knowing they specialized in teaching children and teens, but as it turns out they wanted me for a special team of teachers who teach corporate and government workers. It seems that prior to Chinese New Year one of the 4 members of the team had had to return suddenly to America due to a family emergency and thus they were in dire need of an experienced teacher who could do the job when I sent in my resume. One interview later, with a straight-shooting Australian man named Paul Dunne who heads the program, and I became the new 4th member of the team. ^__^ So, as of next week I will be starting my new job while the office workers scramble to get my work visa in order. Basically I will be working evenings and some afternoons, Mon-Friday teaching groups of 12 or so employees the skills their bosses want them to be taught. Not much different what I did in Japan, actually, but there I was also teaching Children’s classes, whereas here I will be purely teaching adults. This job will also require me to travel all over Taipei, so I am going to get to know this city pretty well, and in fact I am looking forward to having such a chance to learn a major capitol city so well. While there is something to be said for sitting in an air-conditioned school all day, it does get a little repetitive and boring after a while, and I can see this job as being much more fast-paced and dynamic. I am still appartment hunting, trying to find something near a major MRT/Subway/Bus route, and I will keep you posted on how that goes. 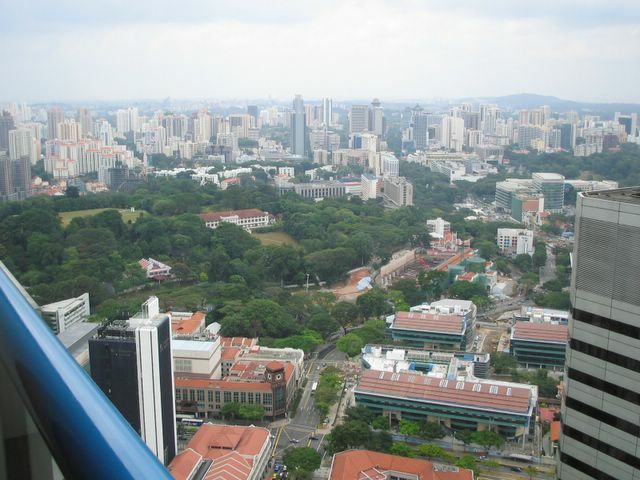 Oh, and I have a huge discussion of Singapore coming, watch for it! Athrun: You said you lost your family on Onogoro Island in ORB, right? Shin: I said they were killed…by the Athha family’s arrogance. Shin: How can you say that to me? Athrun: Everyone who has cried over being powerless thinks that way, I think. But, from the moment you take that power into your hand, you’ll become the person who will make others cry. Don’t you ever forget that. We’ll be going out on the battlefield again soon. Should you forget at that time, losing yourself to your own selfish reasoning and sense of justice, you’ll become a destroyer, using your power recklessly against others. You’re not like that, right? The view to the Northeast from out hotel balcony in Singapore, room 5668, as in, Floor 56 (of 70), room 68. (Although I’d say there were really only 20 rooms on the floor that I could tell.) 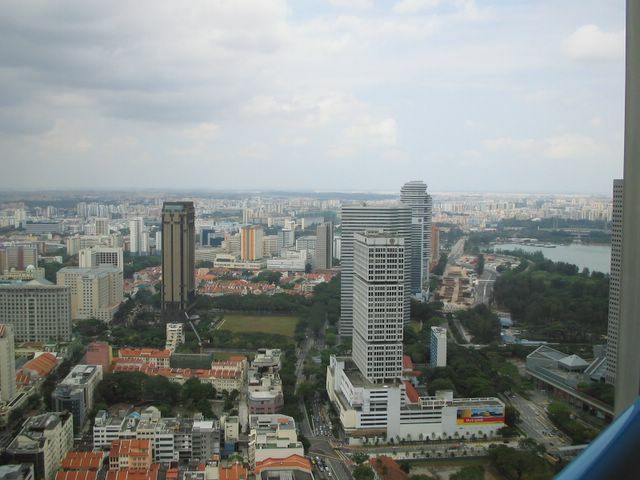 When we were driving in from the airport I noticed that most of the tall buildings in Singapore are painted white, which gave me a clue as to the normal colour of the sky. The weather in Singapore is incredibly gentle, 3 days in the Sun in 30+ degrees temperatures and Rob (who burns bright red in 20 minutes of Ontario Summer sun) didn’t even turn a darker shade of pink, only my face got a little redder. The view to the Northwest from our hotel Balcony. In the far distance we could even see Maylasia when the weather was clear. A traditional old style Singapore streetfront near our hotel. 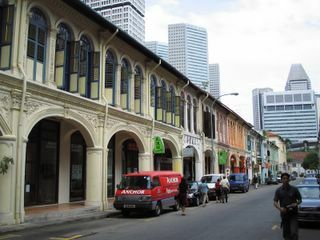 You’ll notice the bright colours; in fact all the “old” buildings we saw in Singapore had shiny bright new coats of paint on their VERY well kept exteriors. Between the gentle weather and the government upkeep the whole city feels more like a theme-park than a real city. It’s like being on a hollywood set they made yesterday because everything is clean and nothing shows any wear. (Unless you look really hard.) It’s kind’ve creepy, really. I shutter to think how many Singaporeans are just employed in keeping the city clean and well maintained. 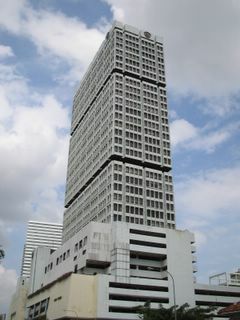 This is the “Shaw Tower”, and if you look reeeealy carefully you can see the Shaw Brothers logo at the very top. The Shaw Brothers were the makers of most of the Hong Kong Kung-Fu flicks of the 1960’s, 70’s and early 80’s and were a group of rich Hong Kong businessmen. They seem to own a couple big buildings in Singapore.